London: Orr and Smith, Paternoster Row,1836. Joseph Paxton was one of the most talented and famous gardeners and garden designers of the 19th century. When he was quite a young man, the Duke of Devonshire recognized Paxton’s skill with plants and hired him to be the head gardener of his estate at Chatsworth. The Duke’s great wealth enabled Paxton to assemble collections of rare and exotic species, including varieties of orchids. 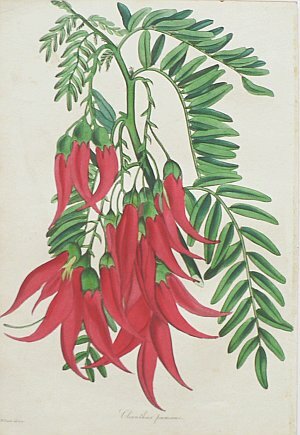 This wonderful print was included in Paxton’s Magazine of Botany. Authorities on antique botanicals have referred to this series as one of the most important floricultural periodicals. (See Blunt, p. 209) The brilliant original coloring was expertly applied at the time of publication and has been perfectly preserved to the present day. It captures every nuance of shading, tone and texture created by the artist, S. Holden, and the lithographer, F.W. Smith. Full untrimmed sheet measuring 9 ½ x 6 ¼ inches.